Easy to cook....Easy to overcook! - They are good for an additional two (2) days with the heads off. - If you want to freeze the shrimp, remove the head first! -Cooking the shrimp with the heads on adds a great, sweet flavor to the meat! - Deveining and peeling the shell isn't really necessary! - Fresh Sunflower Shrimp are easy to prepare. Simply rinse them off; cook with the heads and shell on for the best flavor. You can remove the head easily after cooking, and peel if you wish. Some people eat the shells and all! - Fresh Sunflower Shrimp are easy to cook, but they are also easy to OVERCOOK! 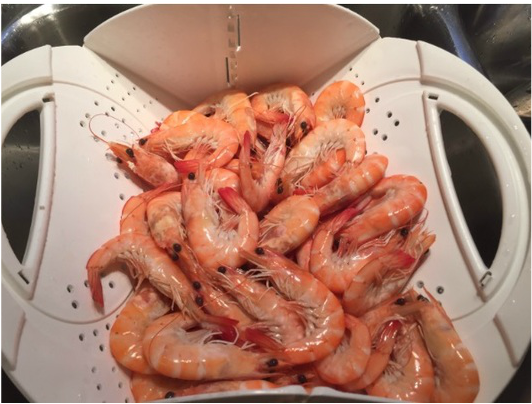 - Boiled: drop them in already boiling water until one or two shrimp float to the top; then remove them all. Usually less than five minutes. Remember: it is not necessary to devein our shrimp that are grown in clean tanks!